M Hameed, N Mungalsingh. Comparison Of Fine Needle Aspiration Cytology Of Axillary Lymph Node And Biopsy In Breast Cancer Patients. The Internet Journal of Pathology. 2018 Volume 20 Number 1. All the patients with a non-operative diagnosis of invasive breast cancer should have ipsilateral axillary ultrasound performed, preferably at the time of initial assessment. If this was not performed initially, it should be done as soon as possible following core biopsy diagnosis of the breast cancer. The number and morphology of any abnormal nodes should be documented1. No national guidelines are available to give the utility of FNA versus biopsy of axillary nodes. They are regarded as equal, however, we had a couple of difficult experiences in reporting of FNA results, and therefore we decided to do an audit while comparing the two techniques by keeping the histology as gold standard. The specimens were searched from last two-year period starting from 1st January 2015 to 31 December 2016. All of the axillary lymph node FNA’s were searched through Winpath search engine. Only the axillary lymph nodes with breast cancers were separated. Out of these all the FNA’s which had no follow up histology were excluded. So, in the end 82 FNA specimens were included in the audit. L codes for fine needle aspiration cytology were used (LC1 to LC5). Our LC3 and LC4 calling is relatively lower when compared with other centres. However, a little more consideration is needed regarding overcalling LC3. Despite the comparable results FNA has its limitations regarding sampling of the correct nodes hence the PPV of LC2 being 17%. There is a significant rate of LC1 which is dependent on performer’s competency among others. All the patients with a non-operative diagnosis of invasive breast cancer should have ipsilateral axillary ultrasound performed, preferably at the time of initial assessment. If this was not performed initially, it should be done as soon as possible following core biopsy diagnosis of the breast cancer. The number and morphology of any abnormal nodes should be documented1. In our Trust, the protocol is to perform a fine needle aspiration (FNA) for any suspicious axillary lymph node. According to the NHS Breast Screening Programme Clinical guidance for breast cancer screening assessment “if an abnormal node(s) is identified, the most suspicious one should be sampled by either FNA or core biopsy. It cannot be assumed that an ultrasonically abnormal node is malignant. The evidence around what cortical thickness can be considered to be abnormal is not clear. Therefore, the criteria and procedure for sampling should be agreed locally and be subjected to an audit. FNAC and core biopsy of axillary nodes are recognised techniques and staff involved in assessment should have the necessary skills to carry these out under ultrasound guidance. If the breasts are normal and other nodal pathology is suspected, then local protocols should be followed to obtain a tissue diagnosis”2. Similarly, according to RCPath guidelines for non-operative diagnostic procedures and reporting in breast cancer screening, “All patients seen in symptomatic and screening assessment clinics who have suspicious mammographic and/or ultrasound findings should have detailed ultrasound assessment of the axilla. Both core biopsy and FNA are used to sample abnormal axillary nodes. FNA is preferred for smaller nodes and for nodes that are close to vessels. Core biopsy may be preferred when the lymph node is large (>20 mm) or when FNA is negative, inadequate or equivocal from clearly radiologically abnormal nodes. The sensitivity of core biopsy and FNA for malignancy in lymph nodes is similar”3. As indicated above, no national guidelines are available to give the utility of FNA versus biopsy of axillary nodes. They are regarded as equal, however, we had a couple of difficult experiences in reporting of FNA results, and therefore we decided to do an audit while comparing the two techniques by keeping the histology as gold standard. Our aim was to assess the efficacy of the FNA of axillary lymph nodes by measuring its sensitivity specificity, negative predictive value, positive predictive value and accuracy. In addition, we wanted to calculate the positive predictive values (PPV) of various categories to compare them with the National breast screening audit 2014/2015. Only the axillary lymph nodes with breast cancers were separated. Out of these all the FNA’s which had no follow up histology were excluded. So, in the end 82 FNA specimens were included in the audit. LC1 Inadequate: no lymphoid cells or technically inadequate. LC2 Benign: benign lymphoid cells regardless of whether specific reactive features are seen or not. LC3 Atypia: atypical cells present, lymphoid or other of uncertain nature and significance. Can be used for the atypical lymphoid proliferations – usually low-grade lymphomas where immunohistochemistry and flow samples not available. LC4 Suspicious of malignancy: either metastasis or lymphoma. Usually only occasional cells present either singly or in small groups. LC5 Malignant: metastatic carcinoma or other malignancy (including lymphoma). The histology of each case was checked and noted down as positive or negative. Later, a separate column indicated if the FNA correlated with the histology or not. For the purpose of clarity, if the LC3 turned out to be negative it was called a correlate and if it was positive it was interpreted as non-correlation. Similar LC4 was considered correlate if histology was positive and non-correlate if histology was negative. Axillary node status is one of the most important prognostic factors in the management of breast cancers. Considering its clinical value various modalities are in use across the world including FNA, core biopsy, sentinel node biopsy, frozen section, ultra-rapid CK on sentinel nodes and OSNA to assess the axillary node status at the time of screening. This not only saves patient an extra second surgery but also avoids the unnecessary axillary clearance which in turns reduces the morbidity4. With the advances in interventional radiology FNA and ultrasound-guided (USG) biopsies remain the most popular and cost-effective technique. Whilst most of the centres have switched to core biopsies our centre still uses FNA of ultrasonographically abnormal nodes as primary procedure for the screening purposes. The protocol used in our institute is that all screen detected breast cancers are given axillary ultrasound test. Then according to the radiological protocol, the suspicious FNA is performed on suspicious results. If the results are LC5, then the surgeons go ahead with the axillary clearance. In all other instances a core biopsy, sentinel or OSNA is performed for confirmation5. The aim of our audit was to measure the accuracy of FNA procedure along with positive predictive value of various diagnostic categories and then compare it with National UK audit on breast screening cases 2014/2015. As mentioned in the results, 17 cases out of 82 had discrepant results i.e. the cytology results did not match with the final histology which was taken as gold standard. In addition, 10 cases were insufficient for diagnosis (LC1). When we looked at the breakdown of the discrepant cases the bulk of the cases belonged to LC2 group. (Table 1). 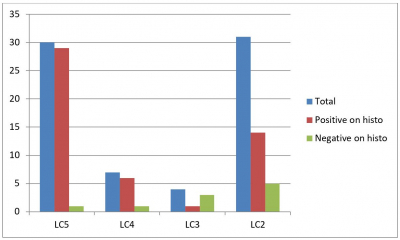 Later PPV of each category from LC2 to LC5 was calculated and then compared with the national audit (Graph C). When these results were interpreted according to RCPath guidelines they show that our institute shows higher PPV for LC4 when compared with national audit which indicate over-caution in reporting of malignancy. There was just one FNA that was reported as LC4 which turned out to be negative on core biopsy. Whilst core biopsies and FNA both have limitations of sampling area no metastatic disease is identified in this particular patient till to date. On review of cytology of this particular case we found that the sample was very degenerative, the suspicious areas marked by the original pathologist showed clumping of cells with hyperchromatic nuclei. Although the nuclear details were not very clear the arrangement of these cells raised the suspicion especially in the setting of high clinical and radiological suspicion. The PPV for LC5 was 96% in our institute which was higher than the national audit (94%). 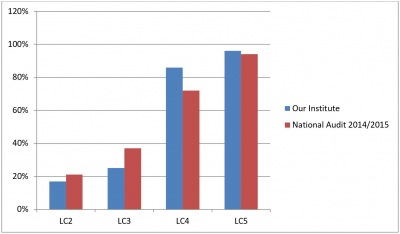 This indicates that our reported LC5 results are more likely to be positive when compared with national audit results. There was just one case that was reported as LC5 which later on the biopsy and axillary clearance turned out to be negative. However, this case was sent to Oxford for specialist opinion and he regarded it as LC2 non-malignant. On review of this FNA we noted that the reporting pathologist had done extensive work up on it by performing immunohistochemistry on the cell block. In addition, a possibility of lymphoma was also raised in the original report. This fact was agreed in the specialist report that high grade lymphoma cannot be entirely excluded. We believe that those suspicious cells were crushed and difficult to interpret. The PPV for LC3 was 25% in our institute which is relatively lower when compared with National audit results (37%). Apparently, it seems that there is low threshold of calling LC3. However, there were only 4 cases reported as LC3 out of which only 1 turned out to be positive. As the sample size is very small therefore it might not be comparable with the national audit results. For the discussion purposes that one case was reviewed and we agreed with the reporting pathologist that very few cells were atypical but the material was very scanty and LC3 was justified. In addition, other LC3 were also reviewed, one of them raised the possibility of lymphoma not a metastatic carcinoma. Later the biopsies were negative. Another case was reported as LC3 but the text mentioned that occasional large cells are likely to be macrophages. The last case was interesting as the reporting pathologist didn’t give the LC category but called it suspicious and could not differentiate between lymphoma and carcinoma. We gave it the LC3 category according to the wording of the report. Later on, the biopsy of the lymph node showed follicular lymphoma. Therefore, despite the fact that it didn’t have metastatic carcinoma but it successfully picked up the low-grade lymphoma. Due to this lymphoma results the LC3 results are debatable as to whether consider this case as correlation or non-correlation. We also calculated the PPV value for LC2 results which came out as 17% which was slightly lower than the national audit results of 21%. Although the bulk of the non-correlation cases were LC2 it is difficult to optimally analyse these results as there is no sure way to prove that the FNA and the biopsy was performed from the same node. Therefore, there is a fair chance that the FNA missed the potentially positive lymph node. In addition, it should be taken in to account that the national audit has combined the results of FNA and core biopsies of the lymph node to calculate PPV results therefore our results might not be entirely comparable. Although LC1 results were not included in calculating the sensitivity and specificity of FNA technique, it does represent the dependency of the technique on competency of the performer among others. Since the patient has to revisit the clinic to get the biopsy performed in the LC1 cases, it is should be considered limiting factor. This will add to the recall of the patient’s posing further financial burden on the NHS and increase the psychological anxiety of the patient. 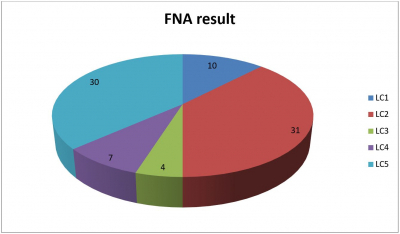 Overall, the FNA results showed comparable results. It remains the valuable cost-effective diagnostic tool. However, greater caution needs to be exercised in overcalling LC3 and LC4 categories. Also, LC1 comprises significant number of final results which are limiting factor for FNA procedures. In addition, the RCPath recognised categories of LC1-5 should be incorporated in the final reports for the purpose of clarity and audit. RCPath recognised categories LC1-5 should be routinely integrated in the reports. Our LC3 and LC4 calling is relatively lower when compared with other centres. However, a little more consideration is needed regarding overcalling LC3. Despite the comparable results, FNA has its limitations regarding sampling of the correct nodes hence the PPV of LC2 being 17%. There is significant rate of LC1 which is dependent on performer’s competency among others. A re-audit is suggested after two years to assess the effect of suggested changes. 1	Gong, Y. in Breast and Gynecological Cancers 19-37 (Springer, 2013). 2	Borrelli, C., Cohen, S. & Duncan, A. NHS breast screening programme: clinical guidance for breast cancer screening assessment. (2016). 3	Lee, A., Carder, P. & Deb, R. Guidelines for non-operative diagnostic procedures and reporting in breast cancer screening. London, UK: The Royal College of Pathologists (2016). 4	Shabb, N. S., Boulos, F. I. & Abdul-Karim, F. W. Indeterminate and erroneous fine-needle aspirates of breast with focus on the ‘true gray zone': a review. Acta cytologica 57, 316-331 (2013). 5	Apple, S. K. Sentinel lymph node in breast cancer: review article from a pathologist’s point of view. Journal of pathology and translational medicine 50, 83 (2016).